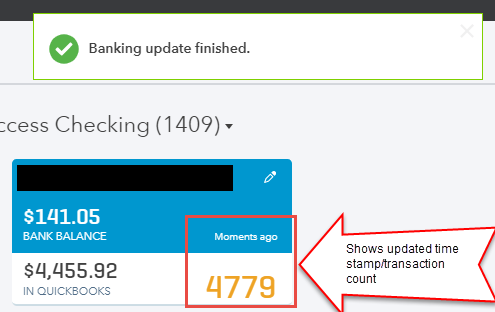 If you get a banking error, the following articles may help you fix some of the most common issues"
If your error code isn't listed above, please search on the Intuit Community. You are notified when the update is complete, and, if successful, the date of last update and total number of transactions shown on the account card change. Some banks and credit card companies don't post transactions for download until later in the day or the next morning. Some banks will show a transaction on their website but won't download the transaction until it posts. If the missing transactions are the most recent ones, wait at least 24 hours in case your bank doesn't make them available immediately.